As soon as I poured the oil in the pot and switched on the heat, I paused for a second and wondered: how was I going to do with this project? I had not touched a bath of deep frying oil in at least more than a year, and even then, I do not often deep fry food. I do not think about it and rarely crave it. Expect for one food on occasions: les frites. If I am craving French fries, I eat them at Central Kitchen in Central Square in Cambridge, where I order moules/frites (mussels/French fries) most of the time. I am very predictable this way. Their long thin crispy fries are just too good, not to mention that it is simply too rare to find this favorite dish of mine on menus around here. They gave me an idea. Known as a grande amatrice of amuse-bouches, you know, these delicious tiny gulf-down-quickly finger foods, I got all excited and caught up in the idea of making amuse-bouches that would involve preparing deep-fried potato nests. I borrowed the idea on the how-to from Working the Plate (the art of food presentation), Christopher Styler’s ideas on how to plate, which I bought a while ago. The realization sounded easy enough: julienne potatoes, then prepare small potato nests that are deep-fried. 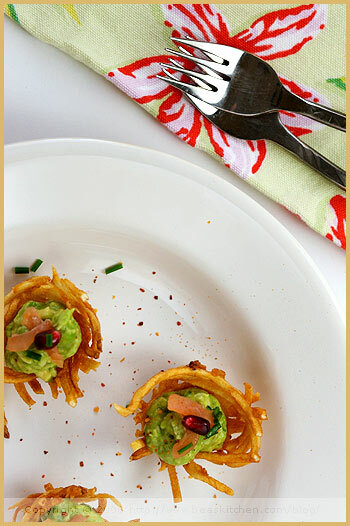 I decided to use them as the basis for a fun finger food: the potato nests would be topped with an avocado garnish, smoked salmon threads and pomegranate seeds, adding crunchiness, color and a tart twist. I could imagine the tastes blend together wonderfully. I was thrilled to try something that I rarely do. To make these little nests of potatoes, I used two small mesh strainers that I typically use for my Asian fondue set. I pressed the cooled blanched shoestring potatoes down in one and placed the second strainer on top to act as a weight. I dipped them together in the hot frying oil bath (heated at 360 F). The tricky part was actually making sure to properly “create” the nests, and to keep the shape. As my mesh strainers are small and have large holes, I sooner or later realized that the potato shoestrings might get stuck. And they did, once in a while. I managed to get them right after a few attempts, which in the end was not as big a catastrophe as I initially thought — oh yes, they made me mad indeed — since I happily gulped down each failed nest. Vengeance ! Crispy pieces of potatoes are just too good to ignore! What else? Once cooked, I placed the nests on paper towels to absorb some of the oil and started preparing my avocado garnish — which I recommend to prepare only very close to the time when you are about to eat. Needless to say that these amuse-bouches were very rapidly eaten. Always way much faster to eat than to prepare! Do you get the logic there? I know why I would be terrible working as a weaver or knitter. To make the potato nests, start by cutting the potatoes with a mandolin into a julienne and blanch them for 2 mns in boiling salted water. Place them on paper towels to absorb the excess water and let cool. Heat vegetable oil in a pot (fill it to about 3 inches high) and take one small mesh strainer. Line it with shoestring potatoes. Press down with another small strainer to give it the shape of a nest. When the oil is hot enough to fry (360 F), dip the two strainers together in the hot oil. Keep pressing the top one down, to make sure the nest stays in place. Cook until brown. Place it on a paper towel and remove the potato nest carefully. Some pieces might get stuck, so push gently with a knife or bamboo skewer to release it. Repeat until you have no potatoes left. To prepare the avocado filling, mash the avocado with a fork, and add the chopped spring onion, lime juice, a dash of salt and Espelette pepper. 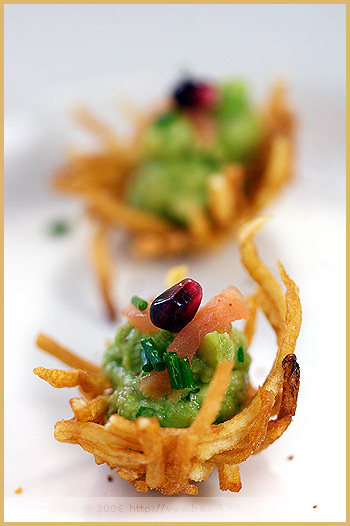 Place the avocado in the potato nest, with a decoration bag if you like. Add tiny pieces of smoked salmon. Decorate with pomegranate and chopped chives. Note: Do not prepare the avocado garnish too long in advance as it might turn dark too quickly, even with lime juice. Do this step at the last minute (very quick to do). Pour réaliser les nids de pommes de terre, commencez par couper vos pommes de terre en julienne fine avec une mandoline. Blanchissez-les pendant 2 mns dans de l’eau bouillante salée. Placez-les sur des feuilles de sopalin pour absorber l’excès d’eau. Faites chauffer votre huile (remplissez une casserole d’huile à 8 cm de hauteur). Prenez la première petite épuisette et placez les pommes de terre au fond. Pressez avec la seconde pour former votre nid. Sans retirer la deuxième épuisette, plongez-les dans le bain d’huile chaud (à 180 C), et faites frire jusqu’à ce que les pommes de terre soient dorées. Retirez-les et démouler délicatement les nids de pommes de terre. Il se peut que des bouts de pommes de terre restent coincés dans l’épuisette. Poussez doucement avec la pointe d’un couteau pour les retirer. Répétez l’opération pour le reste de pommes de terre. Pour préparer la garniture à l’avocat, écrasez la chair d’avocat à l’aide d’une fourchette et ajoutez l’oignon tige haché, le jus de citron vert, une pincée de sel et de piment d’Espelette. Garnissez les nids de pommes de terre avec cette purée, avec une poche à douille si vous en utilisez une. Ajoutez des petits morceaux de saumon fumé. Décorez avec des graines de grenade et de la ciboulette hachée. Remarque : ne préparez pas la purée d’avocat trop longtemps à l’avance car elle risque de s’oxyder, même si vous y avez ajouté du citron vert. Faites cette étape à la dernière minute (très rapide). This definitely is a beautiful dish to tickle the palate. Very artistic! Beautiful presentation! They look so delicious! Yummy good looking potato nests! waouh, c’est superbe, tout en finesse et avec de jolies couleurs… du grand art! J’adore ton titre et tes photos, superbes comme toujours. Alors cette fois c’est la dernière ligne droite avant 2007 ! Tu as eu le temps de prendre une photo quand meme, avant de tout manger. Ils sont vraiment particulierement reussis. Absolutely amazing to look at, and I love the way that they were created! When I first saw the pictures on Flickr I sat and pondered how on earth you could make the baskets, but now I see it’s not *too* difficult 😉 well done! these little nests look and sound wonderful! A perfect recipe to try for New Year’s Eve! And as always, your photos are luscious. Brillaint and tasty idea. 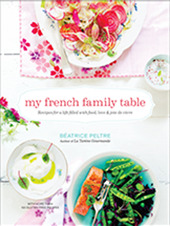 We were going to use traditional canape shells on Sunday, but I think we should try this as well–so pretty and festive! Très joli, la photo est magnifique! I’m very happy to visit your foodblog!!! It’s always amazing, delicious and so pretty!!! Bye and have an happy,lovely and georgeous new year!!! Wow! That’s some really gorgeous appetizers or arguably amuse bouche I’ve ever seen. This would be a great idea for a New Year’s Eve party. Béa, I think they look just wonderful! I love all the colours in this appetizer. Il me semblait bien reconnaitre de la grenade … Excellentes fêtes de fin d’année ! 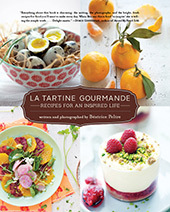 Bea, tu n’es pas tisserande parce que ton truc c’est la cuisine et la photo. Est-ce que je gagne quelque chose poiur avoir trouvé les réponses (LOL)? Those look amazing. I would love to have those at a party. J’aime beaucoup cette idée originale pour l’apéro, c’est de plus super esthétique, je retient. I happily gulped down each failed nest. Vengeance ! I would so love to have vengeance…I would so love to cook little potato nests in your kitchen. I would so love to eat one of these. They do look so wonderful. And I do so love potatoes! Looking for all good things in the new year for you. That is just impossibly gorgeous! It would be so hard to eat it because it’s so pretty……..OK, honestly, I would admire it for about 10 seconds, then I would eat it and demand more!!!!! A fried potato in any form is art, but yours is divine. Congrats on your nominations! Very cute blog..keep it up! i am eating this as i type. Didn’t have the right tools to make the nests so i made little plates instead. Husband loved them. I have a love hate relationship with fish. The hate part comes from the flavor that is emitted from the skin. BUT with this recipe I found that all the ingredients balanced out the right flavours beautifully. You could taste all flavors, nothing overpowered each other and each burst of pomegranate was like that perfect note that song is ended on. I LOVED THIS. I just have to keep practicing with the nests. Since I think this will be a favourite with me for a long time. OH! also made your peas and mint soup. My husband loves pea soup so of course we *heart* that recipe too. Your blog is clearly creeping into my daily cooking routine. Would it be okay to shape and bake the nests in muffin tins, I certainly will give it a try, I don’t like deep-frying because of the smell it leaves in the house for days! I will try baking the potato nests in muffin tins instead of deep-frying, I hate the smell of deep-frying left in the house for days!